Since I figure, some of you might get asked about this, today I will give a quick refresher on Indulgences. First: What triggered such headlines? 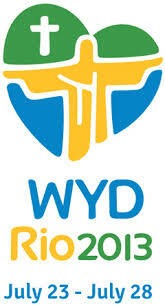 On June 24 the Vatican issued a document stating that those who receive reconciliation, the Eucharist, pray for the intention of the Pope and follow the events of World Youth Day devoutly, (happening in Brazil from July 22-29) either in person or electronically (TV, Radio, Internet) will receive an indulgence. Now I want this to be very clear: It is not just following the Pope on tweeter which gains us this indulgence, we need to actively participate in the liturgical and sacramental life of the Church to receive this spiritual gift. You might be thinking: Why does the Church insists in embarrassing us? Aren’t indulgences a medieval leftover from a period of our history we rather forget? To which I would answer: There is no doubt that there was a time when indulgences were abused by some in the Church. However, the fact is: a teaching does not become invalid because some people abuse it. Indulgences still play a very important role in the spiritual life of Catholics. This is why the Pope Francis, using his authority as the successor of Peter granted this special privilege during World Youth day. What is an indulgence? Well, I could use a lot of “theology talk”, but, I rather explain them like this: indulgences free us from our attachments to sins in the same way exercising free us from our attachment to gravity. What do I mean? Let me explain: every time we sin two things happen: We offend God and we hurt ourselves. When the priest absolves us from our sins he applies the sacrifice of Jesus on the cross as payment. If we are truly repentant, in the eyes of God we are guilty no more. In a more personal level however, every time we sin, especially if it is a sin we commit frequently, like gossiping or visiting some web sites, we gain what I will call “spiritual fat”, we develop an attachment to certain sins to the point that we become enslaved by them. With time these become part of our personality in the same way, eating doughnuts becomes part of our waist line; we which we could be lighter, but our sins make us spiritually heavy and sluggish. An indulgence is like an exercise plan to get rid of all the extra spiritual weight we have accumulated, to help us loose our attachments to sin. Why is losing this is important? Because we know that nothing impure can enter the presence of God, and attachment to sins is the primary cause why we remain impure why we can not reach holiness. Either in this life or the next one we will have to lose all those spiritual pounds we put on in life before we can see God face to face. So what will happen if I have never received and indulgence? Nothing, we Catholics believe that before we enter into the glory of God we have to cleanse ourselves of all sinful attachments in purgatory anyway; however, indulgences are a way of starting this process while we are alive. But not only this, (and this is where indulgences were abused in the middle ages) we can apply these indulgences to our deceased loved ones, so they can become pure and enter in the presence of God, in the same way we pray for their eternal rest after their passing. Now, in case you are thinking the Church made all this stuff up, there is very strong scriptural basis for this teaching. You will not find the word indulgence in the bible, but that is not a problem since, we cannot encounter the terms Trinity, or Original sin either. What we find in scripture is this idea of purifying ourselves before entering in the presence of God and the idea that personal sacrifices help, not only us but the entire body of Christ. One of the places to see this second point happens to be in today’s 2nd reading. Paul says “I rejoice in my sufferings for your sake, and in my flesh I am filling up what is lacking in the afflictions of Christ on behalf of his body, which is the church” (Col 1:24). As a Christian Saint Paul, like us, believed that Jesus’s sacrifice on the cross was enough to pay the price of all the sins ever committed in the past, present and future. If this is the case, isn’t he contradicting this doctrine in this passage? Unless he believed that the afflictions he suffered completed not what was lacking in Christ sacrifice of the cross but was is lacking on us, what is preventing us from enjoying the rewards of this sacrifice. It is obvious that Paul believed sacrifices, and spiritual disciplines have an effect in our spiritual life and in the life of other members of the Church. The indulgence declared by Pope Francis is nothing more than a plan for us to follow and help us enjoy the rewards of Jesus sacrifice. The last thing I’ll like to say is this, Indulgences are not some medieval invention, or an easy way to skip purgatory. They require sacrifice, discipline and prayer, they are part of our faith, and they are there as a gift from God who desires to meet each one us, face to face in heaven. So in this special time of grace, during the upcoming World Youth Day, I invite you to take advantage of these spiritual gifts and to continue moving forward our final goal which is, eternity in the presence of God. AMEN! EDIT: Folks, Jimmy Akin, Catholic Apologist extraordinaire just posted a very informative article which complements very nicely with my homily. It even covers areas I had to leave out because of time constraints. I must say that you have exercised your mind well. This explanation goes a long way toward providing a clear understanding. Thanks Deacon Harbey!